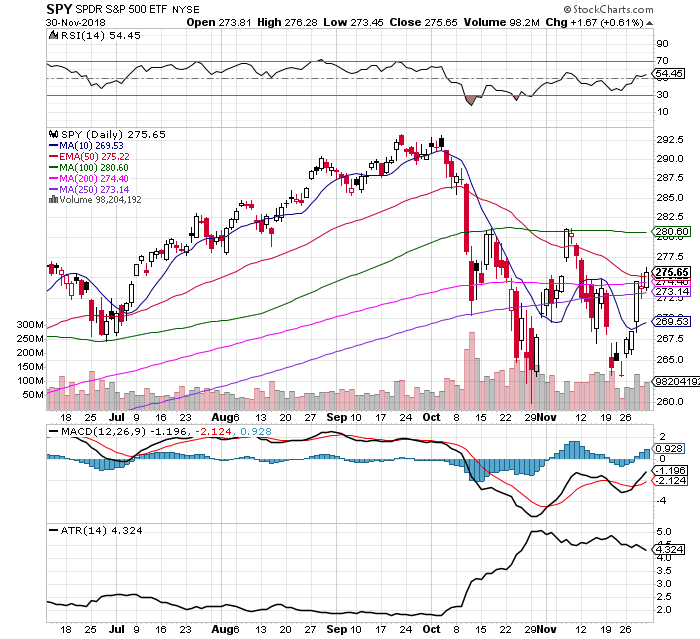 $SPY set off bullish reversal signals by closing over the 50 day, 200 day, and 250 day moving averages on Friday. The Fed chairman’s dovish comments lead the markets to believe that they could be more accommodative on monetary policy than previously thought. $SPY finished higher than the previous close 4 out of 5 days last week. $SPY closed higher than it opened all 5 days last week. $SPY did not make a new lower low on November 23rd. The average true range has been contracting with lower highs and lower lows showing a decline in volatility since the retest of the lows held. The MACD had a new bullish crossover last week. $SPY RSI is back up over 50 at 54.45 for the second time since the October 4th sell off. The $VIX had a bearish 10 day / 30 day EMA cross under that is a signal for decreasing volatility and less fear in the market. The chart currently looks like the lows held and the correction is over for now. A close below the 250 day SMA would invalidate the current bullish signals in my system.